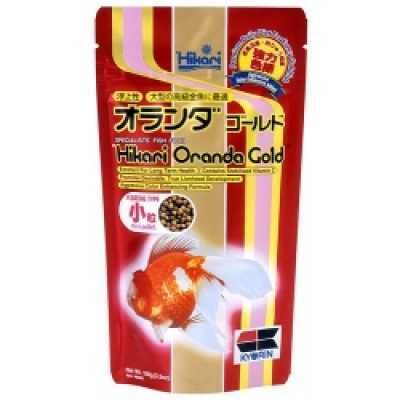 Hikari® Oranda Gold is a food developed specifically to promote prominent head growth while enhancing the coloration of goldfish kept indoors where adequate UV rays are not available to help them formulate colors. Great for Oranda, Lionhead, Azumanishiki, Ranchu and most other fancy goldfish. Regular feeding ensures desirable body structure and excellent appearance. Desirable Form Possible Without Live Foods: Marvelous growth of pronounced head; Live food not required, eliminating the potential for parasite or bacteria problems. Contains Stabilized Vitamin C: Supports immune system health; Promotes a long, healthy life. Excellent Color Enhancing Daily Diet: Outstanding nutrition; Bio-Technology provides a basis for the best color enhancing capacity available; Helps prevent color fading; Noticeable color changes within 30-45 days.